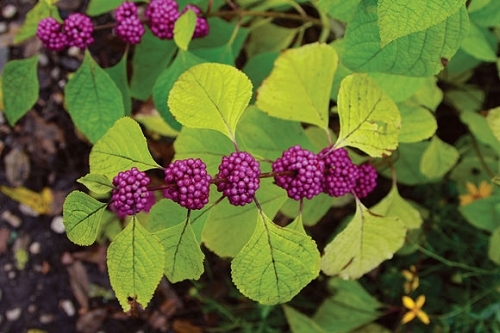 In Missouri, American Beautyberry is a small perennial shrub with striking purple berries in early October & November; further south, the plant can get to be quite large (sometimes up to eight feet). It is a long-lived plant, but during especially harsh winter it may die back to the ground. Wait until spring before pruning any dead branches or cut the entire plant back to 6 - 10 inches in late winter. American beautyberry has small pink flowers from June through August and is a good candidate for the butterfly garden. The berries aren't a bird favorite, but they'll eventually nibble at them late in the year. They are edible for people, though they lack much flavor. A gorgeous though coarse shrub in Florida when bearing ripe fruit, it is much smaller in Missouri. In either state it's fruit is much favored by wild turkey though not as appreciated by other birds who "save them for last." Its leaves, which in Florida grow to about the size of your palm, make an effective mosquito repellent when crushed or mashed in a little water. I suspect brewing them in water to make a "tea" and applying that may work better if the heat doesn't break down the chemical that repels insects, but have not tried that yet to compare to raw crushed leaves. I have had various individuals of this species, now about 6, in two different locations. Some have better form than others, some winters they die to the ground, others they seem to leaf out further up on the old wood. This makes it difficult to have in an ornamental border but also limits it growing out of bounds in a smaller garden, at least in my 6A garden. The berries are phenomenal - even our construction workers commented on them this fall! And fall color (a luminescent yellow) is exceptional, especially paired with the purple berries. This winter we watched a mockingbird consume the berries over a three day period - he'd already eaten all the berries on the possum haw, and bluebirds had finished up all the crab apples. However the same individual had also attempted to eat two faux berries on our door wreath - so I'm not sure he is indicative of his relatives behavior! I have four of these in filtered sun to full afternoon sun. mine do not get too big, the branches are cascading , its not a dense plant thus no nesting and not much wildlife cover. but the berries are great . mine disappear in the fall and I have never seen what eats them. I hear blue birds love them. A: It is typically a more southern species. When we first started selling it, we advised people that it probably wouldn't grow well north of I-70. We've had reports of customers growing it successfully as far north as Kirksville, MO where they planted it on the south side of their house. You can help insulate it overwinter by piling leaves around it. You'll need to remove the leaves the following spring. It can die back to the ground after harsh, cold winters, but it often resprouts from the plant base. If that happens, you can cut off the previous year's dead stems after you see the new sprouts. Q: Is the American beauty berry edible? How large does the bush get? A: In our experience, the berries are edible but flavorless. Here are a couple of other sources: http://www.wildflower.org/expert/show.php?id=2971 and http://www.eattheweeds.com/beautyberry-jelly-on-a-roll/ . In Missouri, the plants grow to around 4 feet by 4 feet. In warmer states to the south, they can grow to about 8 feet. 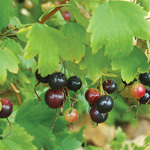 American beauty berry grows rapidly and responds well to pruning in late winter. Q: how tall and wide does this bush get? Can it take full sun? Does it require a lot of watering and care? A: In Missouri, it usually reaches a height of 4 or 5 feet. Its usually as wide as it is tall. It does not require a lot of watering. It will benefit from some mulch when planted, especially when planted in the fall and its immediate future is a seemingly unending, bitterly cold, dark winter....so, just water it when you plant it, mulch it well, and then water in the summer if it looks thirsty. Q: Will it grow near a walnut tree ? A: Probably, but we've never checked for sure.